I am not a huge Basketball fan and don't claim to know much about it, that is why i stick to mostly Baseball talk but I had to write something about the Knicks. The Knicks President Donnie Walsh has done a great job in getting under the Cap and also now getting two players who needed a change of scenery and who could help the Knicks get into the playoffs. Larry Hughes and Chris Wilcox and their contracts wont effect what the Knicks want to do in 2010 with signing at least 2 free agents out of that great class with Lebron James and Dwayne Wade being the 2 biggest names. The Knicks don't have a great record but hey if they make the playoffs they will take it, they are a fun team to watch again and in most every game that they do play. The energy has come back to the garden and for New York Knick fans they are getting excited about the future. This is for the Mets fans out there, yes there are actually some. I am going to try and put some notes at least every other day and don't worry during the season I expect to cover all of their games also pre and post to some degree. You can get a lot of Mets info over at http://metsblog.com Luis Castillo is looking pretty good so far, not limping at all which is a good sign. I am not so sure I like the idea of him leading off though and Reyes batting third, but we will see how this goes. Jerry Manuel has been impressing on the team a team first attitude and it seems to be working so far, camp seems to be fun and upbeat and everyone is just encouraging each other. The Mets are doing this drill where they face 80 breaking ball pitches in a row, the idea is that sometimes you have to hit when you are very tired but you just have to concentrate and not think of being tired. Tim Redding had surgery in November to repair a stress fracture in his foot. When he started throwing again he felt soreness in his shoulder and just recently started throwing again. It looks like he is about a week or so behind everyone else which may open up the 5th starter role to others. He looked like the leading candidate but they also have Freddy Garcia,Livan Hernandez and Jon Niese in the mix. John Maine and JJ Putz threw today and both felt good and looked good. Jerry Manuel said he is confident that Luis Castillo will bounce back and Daniel Murphy will be successful. He thinks Ryan Church will have a breakout year. Jerry seems pretty confident but they have to deal with the 2 straight years of failure and also do they have enough starting pitching?? They also have to stay healthy, no one is betting on Delgado to be as good as he was in the 2nd half and who knows what you will get out of Luis Castillo and LF with Daniel Murphy and Fernando Tatis. These Notes are via Peter Abraham of the Journal News and Yankees Lohud Blog with my own thoughts and opinions mixed in of course. CC Sabathia went home with a stomach flu, he was scheduled to throw live BP today but didn't make it. Bernie bailed out today and won't be back until Monday. Joba threw 2 sets of 20 pitches today resting in between. The idea was to simulate 2 innings, he started out rocky but was better in the second set. Joba said "For Feb. 21 it was just fine." Christian Garcia was impressive, he has great stuff but with him it is a matter of staying healthy. He was a top prospect but always seems to have something go wrong with him. If he stays healthy this year he could be knocking on the door to the majors. It was almost all baseball questions today, which im sure the players were thrilled with. ESPN has had a reporter there the whole camp, you would think they might give up soon. I would say that eventually unless something major happens what else can they do, Arod will be leaving March 1st for the WBC and that should clear everyone out of camp also. The Yankees do seem to be going about their business and not too bothered by it. CC and Nick Swisher seem to be helping with keeping the team loose, they are great guys and im sure everyone is going to love watching them play this year and seeing them in interviews. Arod did banter back and forth with the media today about the economy,traveling to Mexico City and some other assorted topics not related to baseball or steroids. He said he isn't involved with the same group that Nady and Damon got caught up with. Jason Johnson was late to camp because he had a cancerous growth behind his right eye and was receiving radiation treatments. This is scary stuff and it is good to see that he seems to be doing ok now. Joe Girardi did speak today about the strengths of Melky and Brett Gardner and it seems to come down to whoever hits in spring training will get the job, although I do think they will both be on the team. Melky is out of options so they risk losing him if he isn't on the 25 man roster. Dante Girardi-The managers son was in the clubhouse with some of his buddies and they tried to attack Shelly Duncan. At one point he had a kid wrapped around his legs on his shoulder etc, they looked like midgets trying to attack Andre The Giant. 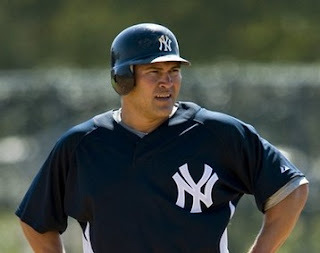 In an article on Foxsports.com Ken Rosenthal he reports that Yankees Xavier Nady and Johnny Damon have got caught in a financial scam that Robert Allen Stanford was running. They said on Friday morning that all their finances have been frozen. Xavier Nady can't even get an apartment in NYC because of this. They both said they were told by their financial advisors th the matter could be resolved within a few days. This is a bad situation as neither player can pay any of their bills or make any large purchases. I hope this matter will be resolved soon, all the Yankees need is more bad news. You get the feeling though that this group is going throughre so much so early that they are going to be a really tough team and able to handle anything. Here is Arod with Joba and Arod sure has the support of the fans out at George M. Steinbrenner Field. He really seems to be enjoying himself out on the field, but this story won't go away, hopefully he will just pour everything in to the baseball field and have a great season. Edwar Ramirez and Jose Veras will not be participating in the WBC, they didn't even know they were on the provisional rosters. Damaso Marte won't be running for at least the rest of the week due to his stiff hamstrings, this probably means he too will be out of the WBC. Derek Jeter, Joe Girardi, Bernie Williams, Mark Teixera, CC Sabathia, AJ Burnett and Arod all met with George Steinbrenner who was in his house today. They all said they had pleasant conversations with him, I wish we could find out what was said. He was transferred from a golf cart to a wheelchair and then wheeled up to his office. Alex Rodriguez commented on his first two days saying the fans have been welcoming and that he is enjoying himself on the field. Bernie Williams immediate goal is to not embarass himself in the WBC but if it goes well he may try to come back to the majors. He is taking part in all of the regular drills with the team. CC Sabathia was pleased with how he was throwing today. Nick Swisher has a nice range of music he likes to put on in the clubhouse. I thank Peter Abraham of the Journal News and http://yankees.lhblogs.com for having this information available on his great blog. Here is a nice part of the Yankees lineup getting ready for their first live batting practice. It is Arod,Damon,Posada and Tex. Here is CC Sabathia with Jorge Posada after throwing his first live batting practice. He threw to a few minor leaguers, throwing 30 pitches of which only 4 were put into play. He was throwing some heat and when he did miss he was missing low which is a good sign. He also said today that he will pitch in his first game March 6 which will line him up for the opener on April 6 in Baltimore. Yes it is Bernie Williams, he is back well sort of. He will be with the Yankees until March 2 working out for the World Baseball Classic that he will be part of with Team Puerto Rico. It is great to see Bernie back in pinstripes and who knows if guys get hurt he may get a deal, no don't get too excited it isn't going to happen. Here is a nice pic of the current first baseman and last all around good first baseman Tino that the Yanks had. They are similar players in a way but Tex is a switchhitter and probably a better player. Please go to daylife.com and type in Yankees to see more pics. 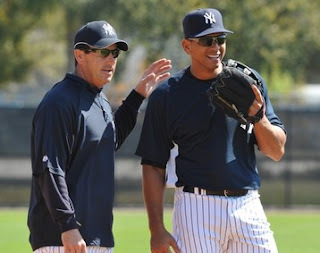 It is good to see Arod just doing baseball activities. It was revealed today that Big Tex will bat third and Arod fourth. Joe Girardi also said today that Hideki Matsui will DH in all of the spring games. He wants his knees to get to the point where he is able to run well. I definitely see the value more and more of keeping Nady and Swish, they are going to need everyone they have. Joe G said right now Matsi is the leading candidate to hit fifth. Christian Garcia and Eric Hacker have caught the managers eye as well as Andrew Brackman. Jorge Posadas reason for leaving the press conference yesterday was he had something to do with his kids. If Arod did something like that they would go nuts and not believe his reason. Arod was the last one out to the field today and recieved a ovation, the fans seemed to treat him warmly. He did not speak to the media today saying talk tomorrow guys. The bottom line is with the fans if he produces and the team wins no one is going to care, on the road doesn't matter because he gets booed anyway. Damaso Martes hamstrings are stiff but he will be fine. Francisco Cervelli is expected back on Monday. Swisher and Tex signed a lot of autographs and talked to the fans a lot. I really think these guys are good guys and will help with the chemistry a lot. I can't wait to the games begin next week and we start counting down to opening day. The manager of the New York Yankees Joe Girardi said he thought Alex Rodriguez emotions were genuine and it should help him move on. He was very happy his players came together in support of Alex. "Fired up, that was great." he said regarding his players showing up. 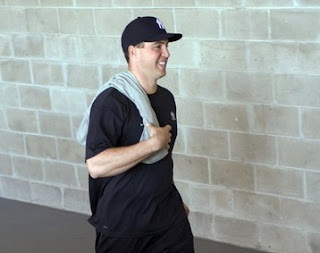 It is clear thought that Brian Cashman wanted to get rid of him and still wishes he would of been gone. When asked about Alex being young and naive he said this: "Those are the facts he gave you, it doesn't mean it's acceptable. I like the fact more that he was stupid rather then young or naive. It was a bad decision that may cost him on so many levels." Then he went on to calling Alex an assett several times, wow very cold. It is quite obvious Cash is not too happy with Alex. Well that should wrap up Circus day, tomorrow is a new day and hopefully we will have some baseball. Derek Jeter is expected to discuss Arod tomorrow and that will be fun im sure. In some Yankee news Nick Swisher had some interesting things to say regarding his possible role, it was good to see. You can read what he had to say in the NY Daily News. In another baseball tidbit Oil Can Boyd at 49 years old is trying to make a comeback, that is funny to me, the guy hasn't pitched in 18 years. Tomorrow is the first official full team workout. Derek Jeter will meet the media for what he says is the one and only time regarding Arod. I think he will actually be more supportive then he ever has been, a lot of people are waiting to see. The Yankees and Arod think this will go away and it won't but eventually if the Yankees don't talk then there is nothing they can do. Hopefully the Yankees will get off to a great start and just have a great season. I am really sick and tired of this whole steroids thing and just can't wait for the games to start even the exhibition games so we can concentrate on that. I actually think Arod did pretty well, there are always going to be questions but the bottom line is he has said way more then anyone else has said including Andy Pettitte and Jason Giambi who were forgiven. I said this to someone today and I really believe it that Arod could go out and cure cancer and people would still be killing him over it, he just can't win. The best thing for him is to just go out perform at a high level and win and stay out of the headlines. Hey everyone the Arod Press Conference is coming in about 10 minutes. There are over 100 media types there, waiting to grill him. Many of his teammates and coaches will be on hand as well as Hank Steinbrenner and Brian Cashman. Derek Jeter said he isn't going to speak until tomorrow. There is talk Arod may donate some money to kids or whatever, hopefully he says as much as he can and gets it all out there and it slowly goes away. I will be back later with some stuff and reaction, everyone enjoy the circus. Here are a bunch of shots from Sping Training today. Tex arrived and addressed the media. I love the shot of Joe G with his son and one with his daughter. Here on the left is Jorge,Mo and Jose Veras. I have one of Derek Jeter and Robbie Cano in the cage and one of Jeter doing fielding drills. 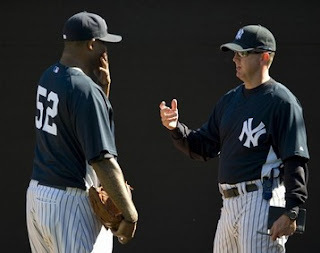 CC in the bullpen with pitching coach Dave Eiland is above. Today was the first day that position players were able to report, tomorrow everyone will be in camp. This should be it for today, tomorrow is a busy day with the circus in town and whatever else takes place. Mark Teixera spoke today and I had hoped to post the audio from Peter Abrahams site but I couldn't get it for some reason. I did listen to the audio and here is some of what he said. He said he was a rookie back in Texas and had a one track mind of just trying to stay in the big leagues, he wasn't thinking about steroids. He said of course you did hear some things about it, rumors,whispers. He said his parents were very strict, no drugs, alcohol and he would never do anything like that but he isn't going to judge anyone. He said he doesn't know where the Arod and him not getting along talk came from since they have a good relationship. He said when he first signed in Texas Arod welcomed him with open arms and took him out to dinner, he just wanted to win Big Tex said. He said he is still good friends with Arod and is excited about the upcoming season and will be at the press conference tomorrow. I hope I can get the audio up but that is the important stuff he said. This is for all my Mets friends out there. I forgot to post this the other day, Jerry Manuel had some interesting things to say. He spoke about batting Jose Reyes third in the lineup and putting Luis Castillo at leadoff and Beltran as his number 2 hitter. When asked what Jose Reyes would think he pretty much said it doesn't matter, im the manager and if I feel thats best for the team then thats what is going to happen. I do like his attitude with that, too many of these players get what they want and it shouldn't be that way. I am sure it will be fun when Jose Reyes gets to camp and talks to the manager about this. I just want to let all of you Mets fans know that I will be trying to do more updates about the Mets in Spring Training and I have some plans for when the season begins so look out for that. This is old news but the Mets also signed Livan Hernandez to a minor deal to try and compete for the fifth spot in the rotation against Freddy Garcia,Jonathan Niese,Tim Redding. Most of the talk down in Tampa today was about Arod and his impending arrival tomorrow. We already know that the old guard Yankees Jeter,Posada,Mo,Pettitte will be at the press conference, we found out today that CC,AJ,Tex,Cash,Joe G and many of the coaches will also be there. Tomorrow should be a fun day. Francisco Cervelli was excused from camp with an upper respiratory infection, this poor guy can't catch a break, Jason Johnson was excused for personal reasons. Mark Teixera said his parents would kill him if he ever took steroids. "In my mind its a drug and my family has zero tolerance for that." He was a rookie with the Rangers in 2003 and said he had no idea about the culture there then. I know a lot of people were asking about this and concerned, at the request of Brian Cashman CC Sabathia has shaved off his beard. Cash said his preference at this point is to have both Xavier Nady and Nick Swisher. I am glad because that is my preference as well, I think they can have a good bench finally if they keep everyone. Joba has made quick friends with Swisher and CC. He actually became friends with CC a couple of years ago and CC is good friends with Nick Swisher. The Arod press conference or should i say circus will be held outside Steinbrenner Field at 1:30PM tomorrow. The position players started filing in today, Nick Swisher and Big Tex have check in as well as the X-man and Austin Jackson. Jose Molina had eye surgery in October and is not wearing contacts anymore which he is happier about. He said it will help him as a player. He said he is prepared to catch as many games as the Yankees need. "You know me,whatever they want." Jesus Montero was hitting bombs to right center in BP today, I love this kid and think he is going to make a big impact in 2-3 yrs. He is only 20 yrs old and will be in high A this year with a chance at moving up to AA at some point. Right now he is still a catcher, most people think he is going to outgrow the position but we will see. I will be posting some photos later of todays action. 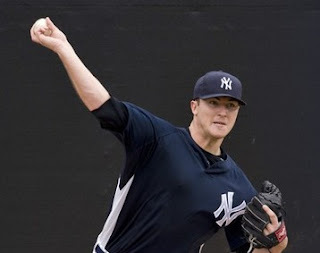 I want to credit Peter Abraham of the Journal News and http://yankees.lhblogs.com for most of the information. Thank you for your great work Pete. Here we go: The groups of pitchers for today were 1.Aceves,Hughes,Pettitte,Wang 2.Coke,Marte,Tomko,Ramirez 3.Brackman,Jackson,Melancon 4.Clagget,DelaRosa,Hacker,Teixera(No not the first baseman, he came over with Swisher in the trade) Brackman was 270 last yr and is down to 232, he said he just needs to get out there and pitch. Wang threw in the bullpen and felt good, he said when he first started throwing earlier in the winter he felt tightness but that is gone now. He will start running in a few weeks. Brackman was impressive to Molina who caught him and according to Rob Thomson the third base coach who said "outstanding" Joe Girardi wants to carry a long reliever and it wouldn't be beneficial to Phil Hughes or Ian Kennedy. The manager said those guys need the innings, he talked to Hughes about this and although Phil would rather be in the majors he will go to AAA and pitch well and be ready when they need him. Pete says watch he will get 10-15 starts this yr in the majors and I agree, someone always gets hurt and Joba will be skipped once in a while to keep his innings down. Posada went through the throwing program today and Joe Girardi watched part of it and said the ball came out of his hand well and "sounded good in the air." Girardi spoke with Arod and said he is eager to start playing baseball. That is a wrap for today, i will post some pictures later. The Yankees will take the field at 11:00AM as they get a later start on Sundays. Andy Pettitte and Ching Ming Wang will throw in the bullpen today. The only other bit of news so far is that Alfredo Aceves will be skipping the World Baseball Classic to stay with the team and try and make it out of spring training. I think he has a good chance at being the long man/spot starter and this is a good choice. Lets hope now that Melky gets the same idea and stays back with the team also as well as Cano. I will be back later with some news about the workout today. Oh yeah position players report tomorrow and the first full squad workout is Tuesday, it will be a circus when Arod arrives on Tuesday, should be fun.